To celebrate our involvement with Pilot Careers Live, we have decided to offer delegates and social media followers the chance to win a free, introductory flight. 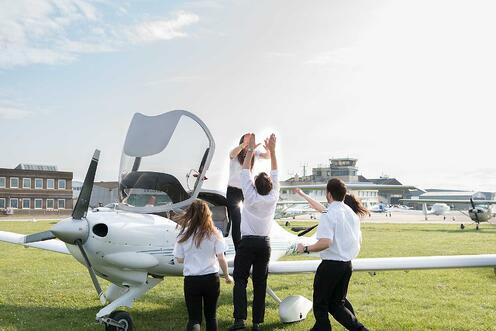 Enter online for your chance to win a 60-minute lesson in one of our stunning Diamond DA40 aircraft, based at Brighton City Airport. These introductory flights are the perfect opportunity to see what it's like fly a fixed-wing aircraft with one of our instructors. All you need to do is add your contact details below and click 'submit'. The closing date for entries is 31 May 2019 and the lucky winner will be contacted by email, before 10 June 2019. One winner will be chosen from all the entries in a prize draw. The winning prize is a £189 introductory flying lesson with FTA in a Diamond DA40 aircraft. The winner will be drawn at random by a FTA representative. Competition entries will be taken until midnight on 31 May 2019. The prize will be drawn on 5 June 2019 in the afternoon. The winner will be contacted by 10 June 2019. FTA will make several attempts to contact the winner. If unsuccessful (within 30 days), another winner will be selected a random. No cash alternative is available and the prize is not transferable, exchangeable or refundable. The promoter’s decision regarding all promotional matters is final and no correspondence will be entered into. The competition is open to UK residents, other than employees of FTA, its agencies or their families. FTA reserves the right to verify the eligibility of all entrants and reserves the right to disqualify any entrant if it has reasonable grounds to believe the entrant has breached any of these terms and conditions.